British Airways (BA) Cargo is the leading cargo airlines in Europe, based in London, United Kingdom. British Airways World Cargo provides cargo services to carry freight, mail and courier traffic to more than 200 regional and domestic destinations in more than 80 countries. BA World Cargo is the world's twelfth-largest cargo airline based on total freight tonne-kilometers flown. 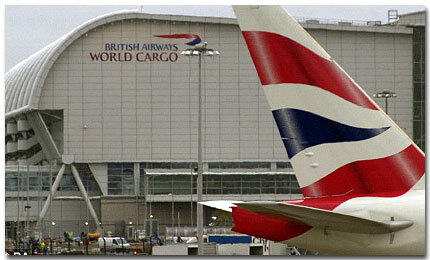 British Airways World Cargo services were started in 1999 at London Heathrow Airport. London's Gatwick is the main regional airports of British Airways Regional Cargo throughout the UK. In 2007, BA World Cargo announced that it launched new services to Jinnah International Airport, Karachi and Allama Iqbal International Airport, Lahore in Pakistan using Boeing 727s via Bahrain. British Airways Cargo service provides shipping of wide variety of products all over the world. British Airways Cargo and freight-handling centre are based in London's Heathrow Airport. British Airways World Cargo is committed to its global freight customers. Its services are Electronic services like Track and Trace system, Combines speed and flexibility with value for money, making it the first choice cargo airline for customers transporting goods anywhere in the world.